Auricle piercing has been in trend from the times immemorial. You must have seen the grannies wearing jewelry in the Pinna section or the outer ear. 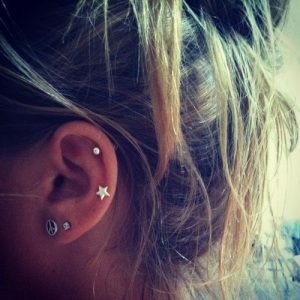 People choose to get the auricle piercings according to their choices or interests. Few may choose multiple piercing on the earlobe while others may opt for a single piercing. Therefore the location varies from the lower end of the lobe to its uppermost section. Are you planning to go for an auricle piercing any moment soon? Here are a few things which you must remember before going for piercing. Auricle piercing can be too painful for a few. But generally, you experience little aching as the ear is made up of cartilage tissue due to which it remains firm even without bones. However, there are nerve endings which sense pain. Make sure the wire or the coiled gauze that is used for the piercing has been sterilized. It bleeds a bit during piercing. Checking whether the instrument is properly cleaned before the process avoids any chances of blood infusion which may lead to several blood infectious diseases such as HIV, Hepatitis, etc. Make sure you go to an expert professional because he will do it nicely. Don’t just go to any shop in order of cost-cutting. Piercing requires immediate pressure so stay calm and composed because if you are too restless, it will cause more pain. How is Auricle Piercing done? If you have made up your mind to get auricle piercing done, then it is highly essential for you to first select a licensed parlor which is authorized to do the piercing. 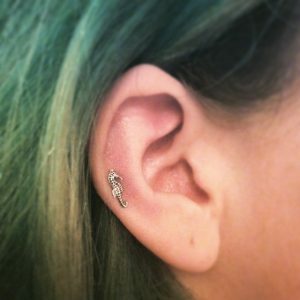 The desired spot where you would like to get your piercing done is cleaned properly, and the exact point is marked with the help of a pen before going further ahead with the process. Then the professional uses a sterilized gauze needle and passes it through the auricle by inserting the jewelry in the process. At many places piercing gun is also used but it is recommended to avoid that as it may not be hygienic enough. 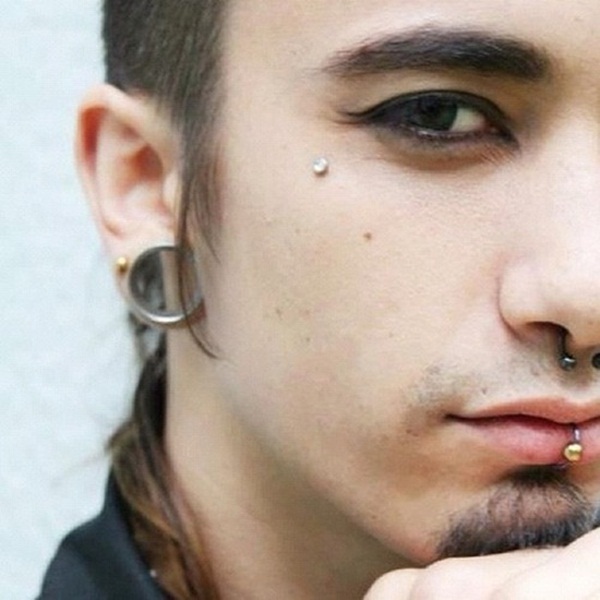 If other than ear styling, you are interested in Eyebrow piercing then check our awesome post on eyebrow piercing. It may vary from a person to another, but generally, it takes three to six months for the healing process. The time reduces if one takes proper care and maintains hygiene. Auricle piercing is a cartilage piercing, and people who have a low tolerance for pain might feel the pain more than the others. Although, the entire process depends on the skill and expertise of the artist performing the procedure. But in most cases mild swelling, bleeding, soreness and bruising around the piercing spot is experienced, although it disappears in a psn of one or two weeks. Include nutritious diet and add stuff like yogurt in your meal. Turmeric has excellent medicinal properties. Being an antiseptic and having anti-inflammatory properties, it reduces the chances of infection in the affected area. You can either directly chew it or apply it by making a paste of the powder and adding rose water or regular clean water to it. Apply some oil or ointment on the pierced area at frequent intervals as it will help in its proper lubrication and also reduce the chances of infection as the oil inhibits bacterial growth. Clean the area regularly with cotton to check the occurrence of pus. Do not eat spicy food or take alcohols that can cause sensations in the pierced area. Do not touch the area very often or with dirty hands as it can cause infection due to germs. Avoid going for swimming till the piercing wound hasn’t healed properly. Do not change the jewelry until the piercing has healed completely. There are two variations in auricle piercing. One is double auricle piercing where two perforations exist on the auricle, and the other is triple auricle piercing where three piercings are done. 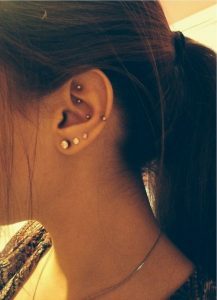 The triple piercing usually takes more time to heal because of three piercings but it looks attractive and beautiful. If you are planning to try something different and want to make it a style statement, then auricle piercing is one of the trendiest options you can opt for. With two variations you can pick any suiting your style and make yourself noticed by everyone. You can select jewelry of your choice by taking help of the piercer. People’s choices vary from small rings to studs, which again is available in different sizes and designs. One thing that should be kept in mind while choosing jewelry for the initial stages is that you should select an option which is made up of non-reactive or less-reactive metals. You can either select gold, platinum or silver, as these metals are less reactive in the air and will not form oxides or cause itching. Although the cost may vary according to the jewelry chosen. Ideally most piercing studios charge between $15 to $20.